Eighteen months ago, I learned about a young man named Boyan Slat. An avid diver, Boyan was swimming in Greece several years ago, and was surprised to see how much trash was floating around in the Aegean Sea. He did some research and discovered that the problem was a global one. 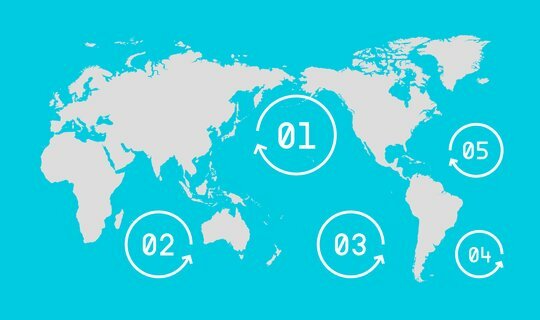 You may have heard of the great Pacific garbage patch, but that’s not the only location where trash circulates along ocean currents. There are at least five of these major currents—called gyres—around the world. As the trash circulates, it eventually breaks down into small particles—especially plastic. Fish then eat this plastic, and eventually, people end up eating some of these fish. It’s a problem that has widespread implications for the ecology of our planet. Many people have come up with ideas to clean up these gyres, but they often rely on unrealistic plans for fleets of boats and nets that would create new kinds of pollution and kill millions of fish. Boyan had an idea—why not build floating filtration platforms, situated within the gyres themselves and anchored to the ocean floor? Since most trash (especially plastic) floats on (or near) the surface of the ocean, natural wave motion could force water through the filters with no resource expenditure necessary, and without endangering fish and other ocean life. Boyan decided to pursue this idea in 2012 while still in primary school, and began building a team when he entered university that now consists of over 100 fellow students, professors, and experts around the world. They named it The Ocean Cleanup. I met Boyan eighteen months ago, and I resolved to help the team by connecting them with the global community of SOLIDWORKS users. They needed people with expertise in engineering, and what better group to assist? 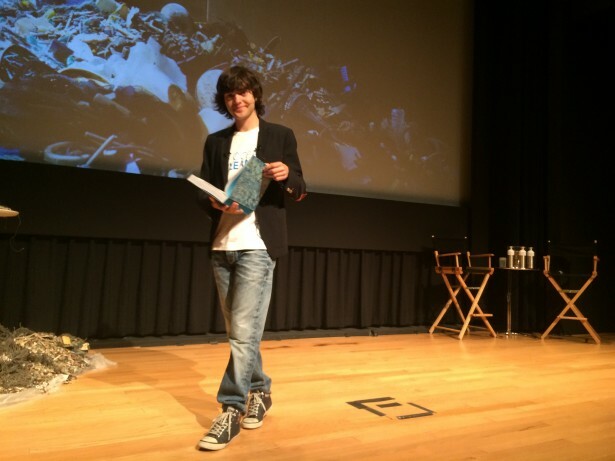 Last year, we collaborated with the team on two contests—one that they managed, and one hosted by SOLIDWORKS—and also invited Boyan to speak at our SOLIDWORKS 2014 launch event to help get his message in front of the North American press. He even joined us at SOLIDWORKS World this year. 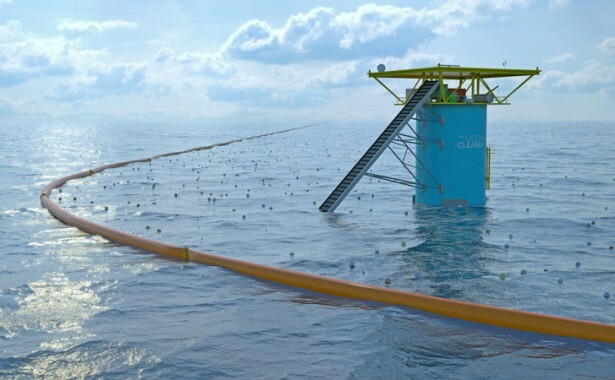 One of the biggest milestones the Ocean Cleanup team has been working toward is the completion of a large-scale feasibility study, which will help them decide how to proceed with design, implementation and operation. Earlier today, I attended an event in New York City hosted by the team, with the purpose of releasing the findings of the 530-page study. The team learned many things during the process of finishing it. The biggest finding was that the idea is, in fact, feasible. They learned that the original design of their filtration platforms would likely not survive the harsh conditions found in the Pacific ocean, and they have come up with a new design that is less beautiful, but will actually work. The team also learned that in most places, plastic is concentrated in the top three meters of the ocean, and that their platforms could catch most of it while ensuring the safety of ocean life. And they also learned that the booms needed to direct plastic toward the platforms could be reliably moored to the ocean floor–in fact, the method is similar to the one used to anchor buoys and other floating structures. Now that they know the project has a good likelihood of succeeding, the team is moving into the next stage of their plan–building and testing a functional prototype. To make that happen, they have launched a new crowdfunding initiative on their website, with a goal of raising two million dollars. The team put on a great event, and I got a chance to talk to several members from both The Netherlands and the US. I was even lucky enough to meet Boyan’s mother, who flew to New York to support him. Everyone I talked to was enthusiastic about the project’s future, and they’re hoping that the release of the final study will encourage more people, companies and organizations to get involved. 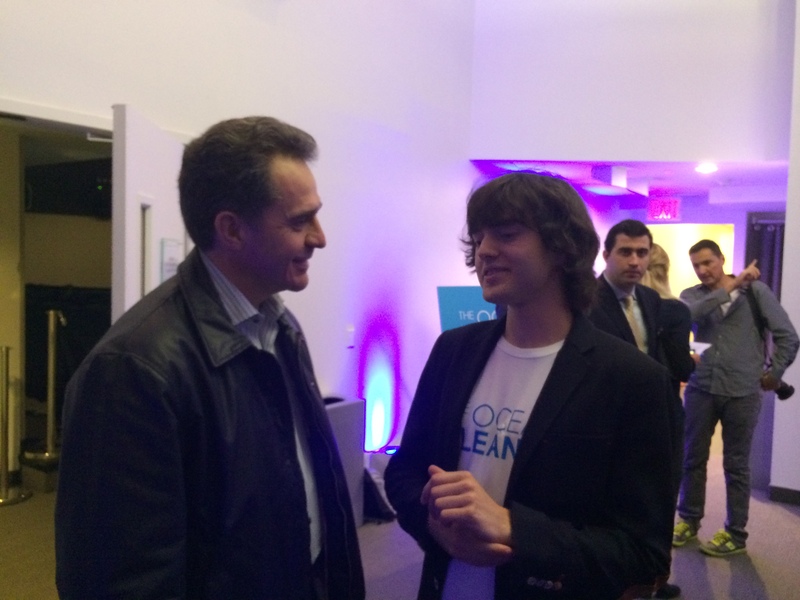 Please join me in congratulating Boyan and The Ocean Cleanup team. If you are interested in the future of our oceans, I encourage you to visit the website and learn more about the project. We at SOLIDWORKS pledged our support during the first stage, and I am committed to continuing that support as they enter this exciting next stage. Bertrand Sicot is CEO of Dassault Systèmes SolidWorks Corp.